Ben Read (red) in action for City of Peterborough against St Albans. Photo: David Lowndes. City of Peterborough delivered a top-class display to become the first team to take points of East Premier A Division leaders St Albans at Bretton Gate today (November 4). Goals from Adam Wilson, against the club he played for last season, and Ben Read gave City a thoroughly deserved 2-0 lead at the break. Joe Finding (red) in action for City of Peterborough against St Albans. Photo: David Lowndes. It was far more even in the second-half, but City withstood some heavy late pressure to preserve an impressive clean sheet, while always looking dangerous on the break. 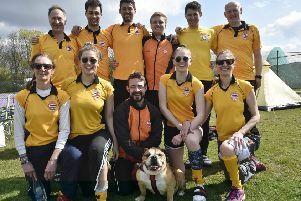 St Albans had won their previous six league games, but had no answer to City’s high pressing, fast tempo brand of hockey on a pitch with a considerable built-in home advantage. Wilson struck with a ferocious strike from the game’s first short corner in the 12th minute before Read’s superb run and shot made it 2-0 on 20 minutes. In truth City should have been out of sight at the break as other chances, and two more short corners, came and went. Read was rampant in midfield areas while Manish Patel popped up to great effect in several positions. Wilson and Brendan Andrews never gave an over-worked defence a minute’s peace. A shot at goal from City of Peterborough's Alex Armstrong in Saturday's win over St Albans at Bretton Gate. Photo: David Lowndes. But the chatter at half time predicted St Albans would improve and that City might struggle to mantain their own relentless pace. And so it proved, particularly in the final quarter when St Albans started to dominate posession and create some scoring chances of their own. But City goalkeeper Cameron Goodey made a couple of great saves and there was some defensive excellence from Joe Finding and co. Finding’s ability to relieve pressure with well-judged aerial passes was crucial. Despite seeing much less of the ball, City still looked a threat on the break. Danny Sisson was twice denied a goal by fine saves from the St Albans’ keeper. Adam Wilson (right) crosses the ball for City of Peterborough against St Albans. Photo: David Lowndes. City, who remain unbeaten, are now just a point off top spot.